This bench has been designed so it can be made from easily available materials without sophisticated woodworking equipment. People with woodworking skills might use these ideas as a point of departure. Cut the pieces, except for the sweeps drawer components. The dimensions given do not allow for a saw kerf. If you are using a handsaw, this space is not too important, but you should allow for an 1/8″ kerf if you use a table saw. Glue pieces A and AA together to make the top. Use white glue like Elmer’s or Tite-bond, set the pieces together, and clamp or weight them overnight. Traditionally, jeweler’s benches have a “belly hole” to allow closer access. Benches without cutouts are preferred by watchmakers. Use a saber saw after the parts have been glued together if you want a hole. 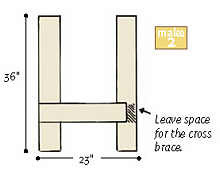 Make both leg assemblies, using a square to be sure that the pieces are at right angles. Clue and screw each joint. Screw the 2x4x46″ cross brace into the leg braces. Glue and screw. Attach the back (D), allowing half of it to project above the legs. lay to top in place and use the 3″ screws to join it to the legs. Use four screws across the back (D) to anchor it to the top. 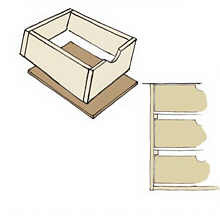 Make a plywood box to hold the three drawers. This will be fully assembled, than screwed onto the underside of the top. First, cut 3/4″ by 3/4″ strips from a 1×6 to make the, cleats. Nail and glue these onto what will be the inside walls of the box. Nail the top and bottom between the sides. 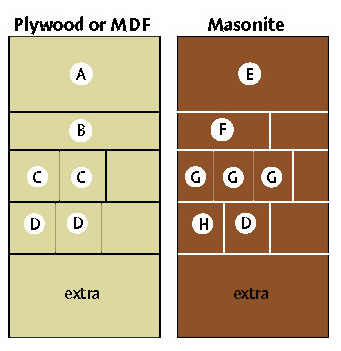 Lay the box face down and nail a Masonite panel on the back. 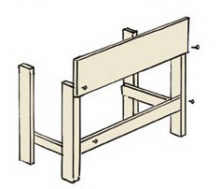 Flip the bench upside down and set the box into place Attach it with screws into the top and the legs. 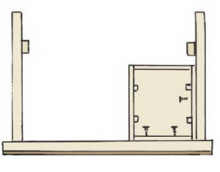 The drawersides, fronts and backs are made from of 1×6. Nail or screw them together, than glue and nail a Masonite panel on the bottom. Sand all the edges to make them round. The sweeps drawer slides between the two cleats on each side. If all other measurements were accurate, it will be 29″ wide, but this might have changed. 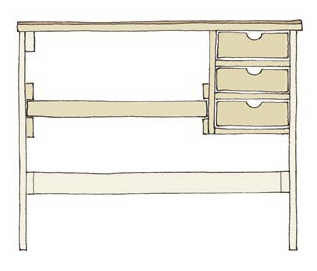 Measure the space and make the drawer to match. 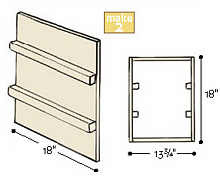 Assemble like the other drawers, using 1×3 boards for the sides, front and back. 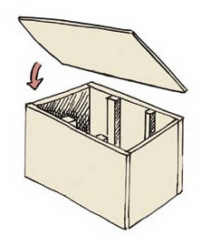 You can be cut on the dotted line for easier access, but don’t cut away too much of the sides or the drawer will tip forward when open. 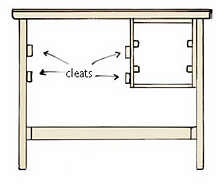 Rub the drawer bottom and the cleats with soap to help them slide easier.